← Wholesome Beef-A-Roni for the Kid in All of Us! In a mixing bowl, cream the coconut oil, honey, and maple syrup until well incorporated. Add egg and beat well. Beat in vanilla. (mixture will appear curdled — due to texture of coconut oil.) In separate bowl combine flour, oats, baking soda and salt. Gradually add to oil/sweetener mixture and mix. Stir in dark chocolate chips. Drop by rounded spoonfuls (about a tablespoon) onto a baking sheet. Bake at 350º for 7-8 minutes. The cookies will spread and ideally the bottom will be browned. This lends to a nice crispy texture when cooled. This yields 28 to 30 cookies. **I learned after the first batch to only put 8 on a tray. I baked mine for 7 min 30 seconds and then cooled them on the tray for a minute before transferring them to the cooling rack. 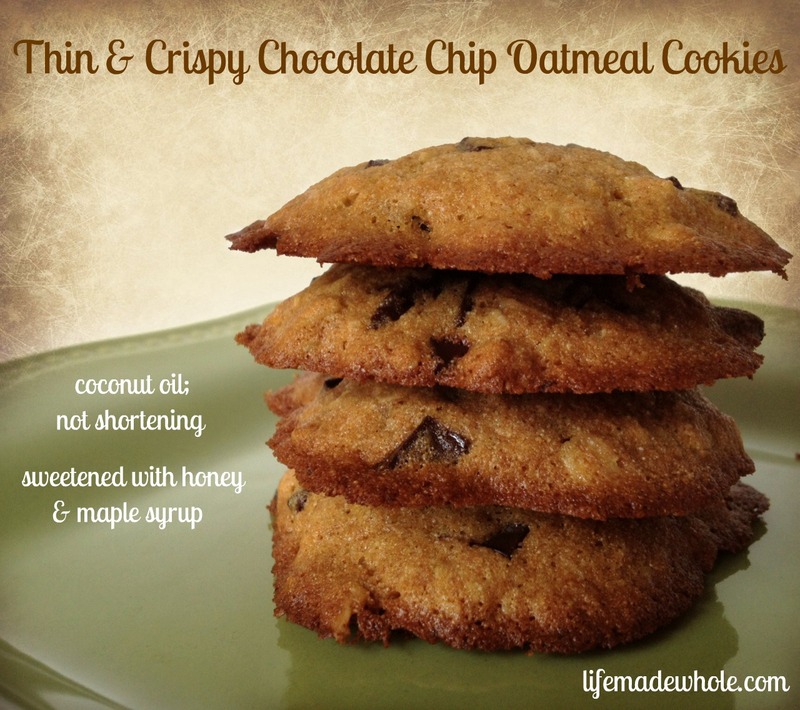 This entry was posted in Desserts, Easy Kid Treats, Entertaining and tagged chocolate, coconut oil, cookies, maple syrup, raw honey, spelt flour. Bookmark the permalink.